A break from the kitchen reno! I thought I'd take a brief break from the kitchen renovation to talk about our super fun weekend! We started off by heading up to Pontiac, MI to see Sufjan Stevens at The Crofoot. He hasn't toured in 2 years and wasn't playing here in Chicago so that concert was the basis of our whole Michigan trip this weekend. As always, Sufjan was amazing! He even played Majesty Snowbird which is my fave unreleased Sufjan song ever! We had to wake up bright and early on Saturday morning (in the 5:00am hour) to head over to Ann Arbor to start tailgating for the Michigan vs. Indiana game! And wouldn't you know it - we won!!! That's 4 straight games so far this season. 1 more than the entire last season. 100% less losses than last season too! Speaking of last season, when we got home from the game, I was checking my email and up popped this one from Scrapbook Trends. See that scrapbook page? It's mine!!! The page is called "The Worst" and it's about the Michigan vs. Purdue game we went to last season. Both teams had the worst ratings in the Big 10 at the time and we took an early lead which made us start chanting "We're not the Worst!" over and over. 7/19/08 - The second day of the Pitchfork Music Festival, lots of great tunes, and lots of mud thanks to the rain the day before. During the day, we amused ourselves watching these crazy mud people and trying very hard not to get too close and get slopped on. Later that night, we got to my car where we saw it had been broken into and among other things - my laptop had been stolen. Woohoo! Almost a year later I can look back at that day and smile at the good times we had earlier in the day instead of focusing on the negative. Finally! I created this hybrid page recently. It's barely hybrid, the only computer generated thing is that I created the 3 photo strip in photoshop and printed them as one large picture. 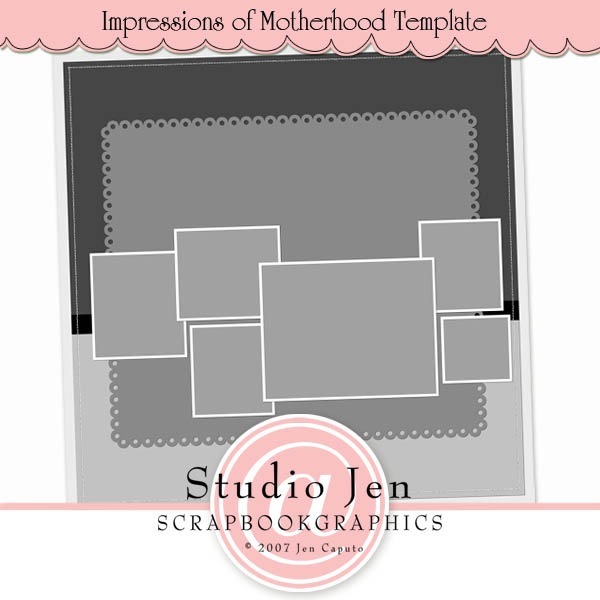 I based the design on Becky's sketch for Creating Keepsakes that will be in the July issue (it was on their webpage a few months ago). I loved the sketch but I'm personally not a single photo scrapper or a double pager so I modified it a bit to work for me. I whipped this card up tonight in a matter of minutes thanks to some fun goodies from The Paper Maven along with a Making Memories rub-on. The bunched up fabric thing is actually a Venetian blind sample. A friend of mine picked up an organizer full of them for $5 at a Great Indoors going out of business sale. He just wanted the organizer so he gave me all the samples thinking I could do something crafty with them. Kinda fun huh? 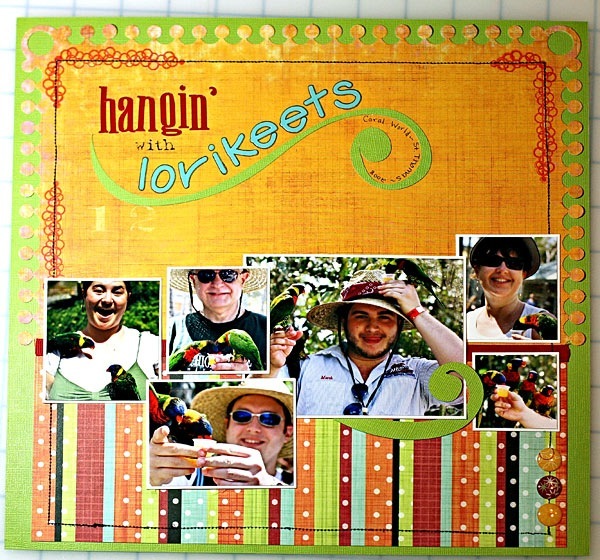 Next, I have a hybrid scrapbook page for you! 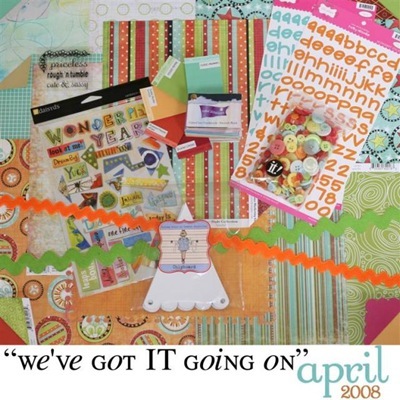 I used one of my digital scrapbooking templates to size and print the pictures and to print the journaling in the shape around the circle. I also designed a file in Adobe Illustrator of the large scallop circle (about 6.5 inches) and cut it with my Wishblade. I curved the "'till the end" sentiment on the block to make it match the curve of the flower. 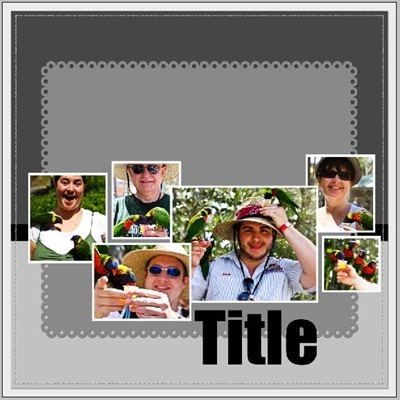 One of the PTI Guest Star Stamper contests this month was to create a scrapbook page. As a scrapbooker, I jumped at the opportunity to win some PTI goodies! I created two pages for this contest and this is the first. 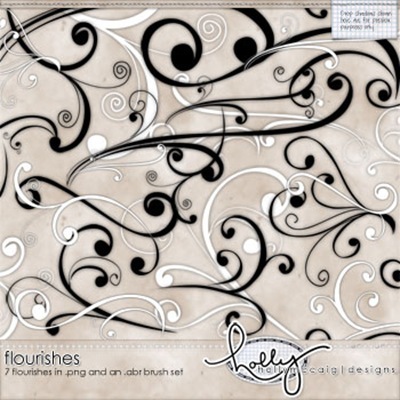 I used Damask Designs to create all of my background papers. Love that set! The pictures are from when we saw Low @ Epiphany (a church downtown). Since it was such an elegant location I thought the elegant Damask images were only appropriate. I have some new templates in the store and I think they are pretty keen :) What do you think? They are normally $6. But I currently have them marked down to $5. Hurry, offer expires 2/23 at 11:59PM EST! I used a bunch of goodies from a Studio Calico kit and just added some ribbon from PTI. Lastly, I did a bit of spring cleaning and added a bunch of craft goodies to ebay. Go check it out! I'd been itching to do more hybrid pages and since I had the day to myself today, I finally got to play! 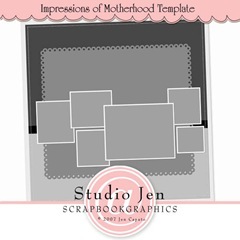 I started out with this sketch I created for the SBG Impressions of Motherhood collab. 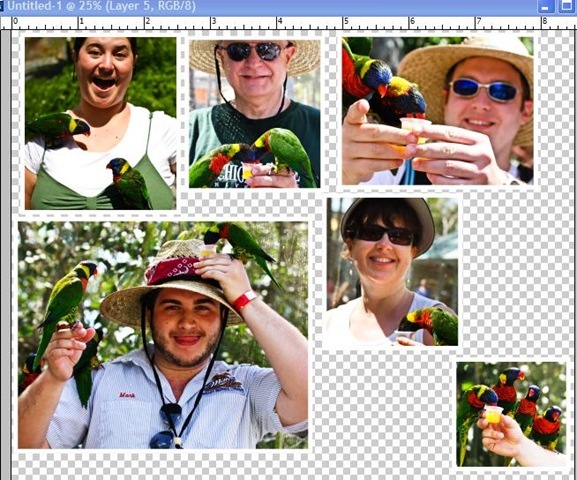 I picked my pictures and clipped them in the template just like if I was doing a digi layout. Then I dragged all of my clipped and sized photos into a new black document and printed that out. I put it all together with some goodies from the April It Kit Studio kit.